Poffertjes are traditional Dutch cakes, a bit similar in texture to American pancakes, but Poffertjes have more spongy and light texture. 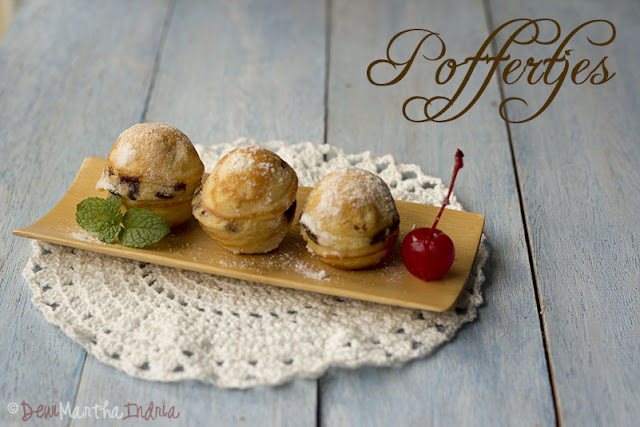 Poffertjes is also well known in Indonesia that is has historical ties as the former Dutch colony. 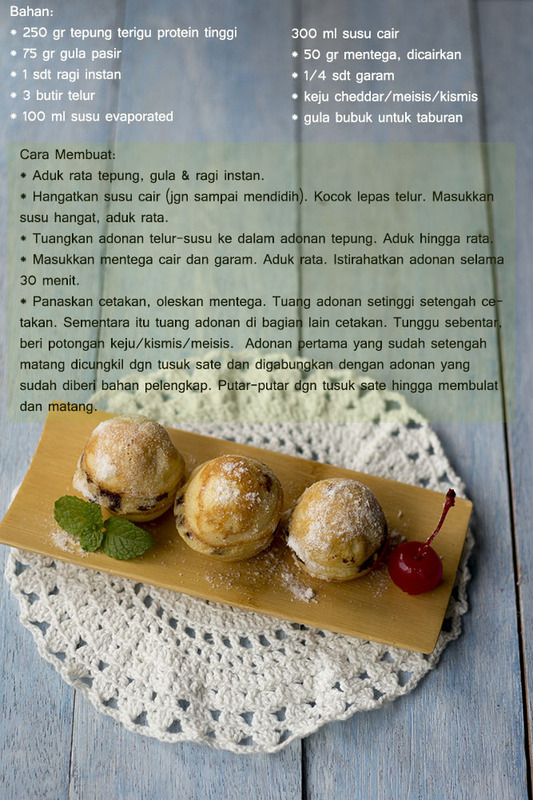 In Indonesia, this cake named Kue Cubit. Poffertjes are cooked in a special cat-iron pan with several small shallow indentations in the bottom. 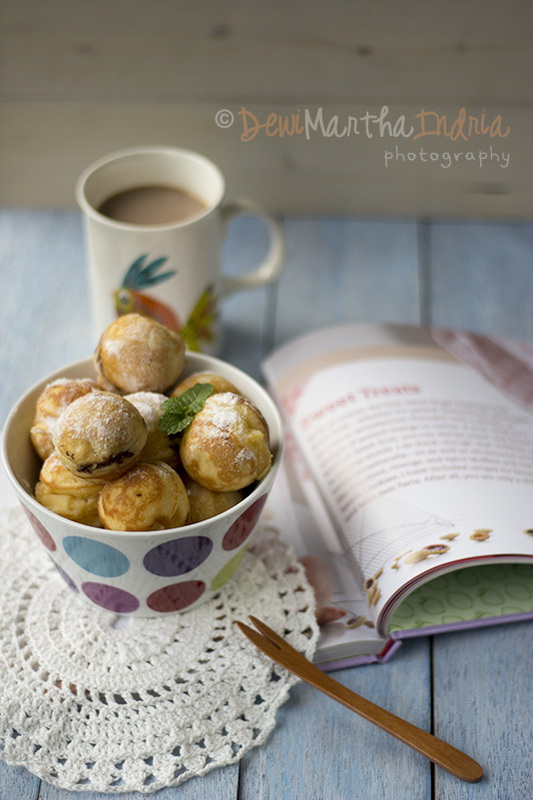 I used the pan that can be used also to make Takoyaki (traditional snack from Japan). 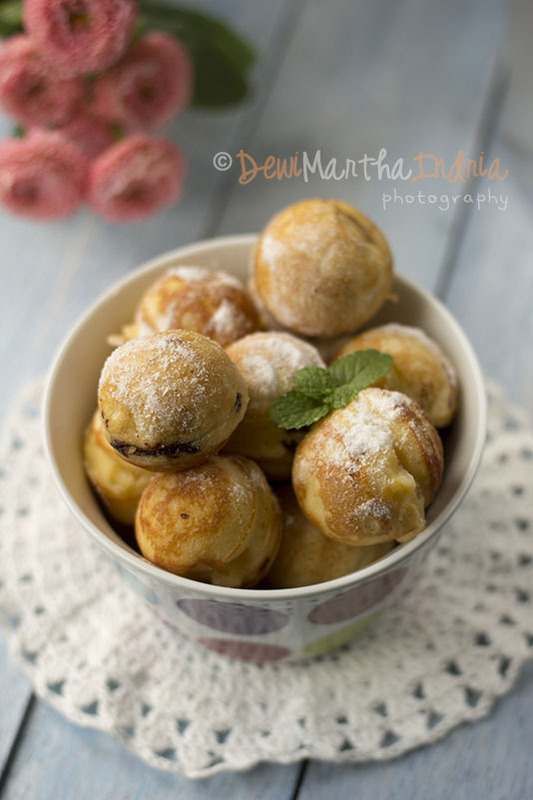 If you search in Google, many original recipe of Poffertjes said that this mini pancakes made from buckwheat flour, but other variation of flour allowed. In Dutch Delight, history told that long time ago when French Revolution happened, due to low shortage of wheat flour led to this pancake was being made by buckwheat flour, that is resulting thicker and tastier taste. I got the recipe from Pinodita. Original source of the recipe from the Primarasa Femina recipe book "Hidangan Peranakan Belanda & Cina". Mix flour, sugar, and instant yeast in a medium bowl. Stir well. Set aside. Heat the milk until lukewarm. Beat the eggs, pour milk and mix well. Add melted butter and salt to the batter. Mix well. Cover the bowl with plastic wrap and allow to rest for 30 minutes. Preheat the poffertjes pan and grease with the batter. Fill the pan only about halfway or less. Wait for a while. Filled or sprinkle the cheese/jimmies/raisin. Pour more batter in the other part of pan. Let it cook until the bottom has started to harden or look more brown. Use bamboo skewer to turn them around. Pierce the poffertjes with the skewer and use a circular motion to roughly flip the half-ball over the poffertjes that has been sprinkled by cheese/jimmies/raisin before. So that half-cooked batter flows out into the mold to form a ball. Turn them around for several time until well cooked. Put them in serving plate and dust with powdered sugar. Ready to eat. Copyright © 2014 Dewi Martha Indria, unless otherwise stated. All Rights Reserved. All photographs and written content are registered and copyright protected, may not be used in any way without my permission. If you like to use some of my works, please contact me. (c) Dewi Martha Indria. 2012. Simple theme. Powered by Blogger.